Lovely Views - Priced to Sell! 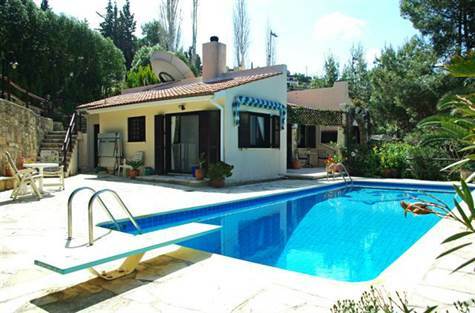 Kamares, Paphos - This charming property is in a great area of Kamares and enjoys great sea views. With this home you will also have access to the Kamares Club that boasts a lively bar and restaurant & a communal pool with views to the western coastline. During the week activities are organized such as a keep fit class; video, DVD and book rental; a beauty salon; free tennis courts; 'walking groups' and a shop for 'essentials’ as well as a full maintenance team for repairs, extensions or pool cleaning. Tala village boasts several local businesses & mini markets, a bakery, boutique, hairdresser, nail boutique, delicatessen, car hire, FedEx, post boxes and many very popular bars and restaurants. The villa comprises a good size L-shape lounge/dining room with a log burner fitted into the open fireplace and two sets of patio doors onto a terrace covered with a pergola. From the lounge an attractive stone archway leads you into the kitchen/family room and laundry. The kitchen is fully fitted with a limed oak finish with a limed oak door leading into the utility room with the same finishes. The other end of the kitchen is the family room or further dining space. From the lounge a door leads to an inner hallway, off of which are the three bedrooms and family bathroom. The master bedroom enjoys ensuite facilities and fitted wardrobes with mirrors. The other two bedrooms have fully fitted wardrobes and share the family bathroom. Outside there is a garage to the right and a series of shallow steps leading up to the property. To the left of the property there is gravelled parking with a side gate leading into the garden. There are plenty of sunbathing and alfresco eating areas outside the villa and around the pool, the gardens being well stocked and mature with steps leading to an upper level around the side and rear of the property with an elevated patio. This property comes with full title deeds and is priced to sell. It is ideal as a family home or a holiday property.